As you know I love numbers and stats. The power of actual data has the greatest influence on my decision making. So – when I find interesting data – I like to share it. This week my favorite weekly email – Marketing Charts – connected me to a new Nielson study. The title is How Loyal Are Your Customers? A View of Loyalty Sentiment Around the World. The study was done Feb 18 – Mar 8, 2013. There were 29,000 internet respondents from 58 different countries. You can click here to see the whole report. I would like to simplify the findings for you and just focus on North America results. Even this small part of the whole research project shares some great insights for all businesses. Here are 4 key questions. 1. 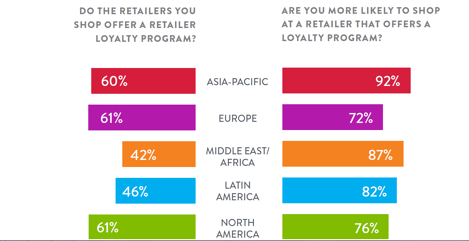 Are you more likely to shop at a retailer that has a loyalty program? 76% in North America said YES. The overall number around the world was 84%. Loyalty programs are prevalent and in demand by consumers. Retailers have realized that the data allows them to better meet their customers’ needs. This data helps them find new and innovative ways to achieve benefits most important to their customers. Wow – I was so glad to see this comment. Loyalty programs are successful if they are great for the customer. This is why they need to evolve and change. Consumers can get tired of the same rewards and offers – loyalty programs give the retailer the ability to keep things fresh for the consumer and continue to make the benefits valuable. 3. What loyalty benefits matter most to you? 4. What would cause you to opt out of or not join a loyalty program? What I found interesting in this question was how few people would leave a loyalty program because of too many emails. I think that we are used to lots of emails and have come to accept and deal with lots of offers. Every other country in the world had at least 28% of the respondents that would leave a loyalty program if there was too much communication. The bottom line for me is that consumers want loyalty programs, they prefer businesses with loyalty programs, they expect benefits that they value and they don’t mind being connected with via email or text. The key take away is that all aspects of loyalty marketing should focus on the benefits that are most important to the customer! Still looking for a loyalty program that is easy for your customers to join and easy for your employees to implement? Click here to learn more!